Hello everybody! Happy Monday and start of spring! It's nice to see some sun and warm weather, even if it's supposedly temporary. I've kind of got a lot going on in my life right now. I'm finishing up my last class before I get my BS and start working on my MBA. My dad is wrapping stuff up in NC and is headed here shortly to help us finish the house in the next month. We're going to be moving back home to NC, so I've started the first stages of packing. I've also got the wedding planning almost done, with some hiccups along the way (including my dress ordered in the wrong size grrr). I just want to let you guys know that I still love all of you, still love the blog, the blogging community, etc. but please understand if I'm not as active in the next few weeks with my posting and commenting. I weighed myself mid-week and had gained, but weighed myself now and am 1 pound less than last week's weight. Phew! That's stil a -2lb. weight loss from the start. Enough with this yo-yoing!!! Still holding strong on the "no soda challenge." She's down ANOTHER 2 pounds! A grand total of 8.8, and only .2 lbs from her 5% weight loss award from WW!! She is staying the same, but would like to lose something next week. Her total weight loss is still around 7 lbs! I'm going to take a hiatus from the menu plan in the meantime. I want to work our way through the freezer and pantry before the move, so I'm going to be more in a "throw meals together" mode instead of planning and purchasing specific menu items. There are some really great food documentaries out there. If you have Netflix, quite a few are on streaming, otherwise you can rent them. 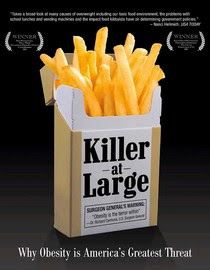 Health wise I've watched Killer at Large: Why Obesity is America's Greatest Threat and Food Matters. Both of these really wake you up about some of the goings on in our bad health, FDA rules, food production, etc. Some obvious shock and awe bits, but for the most part they are really informative and compelling. Entertainment wise I've also watched Kings of Pastry and Pressure Cooker. These are really awesome if you're into food and competitions. Kings of Pastry follows french pastry chefs fighting for the highest honor in France and Pressure Cooker follows a Philadelphia high school culinary class as the students compete for culinary scholarships to go to college. There is a HSN Spring Weekend Event being hosted by Bon Appetit March 26-27th. Click here to check out the schedule, which features some well-known chefs, and some of the great products they're offering. *Disclaimer - I'm receiving a $10 HSN card for posting the above notice and link. I'm going to be selfish and keep it for myself since we have the upcoming move and wedding which require tons of purchases. Good luck with everything else in the coming months! You take care of yourself while life is so busy, ok? And check in with us when you can!!! We'll be here when you get back Christina - no worries! You do have so much on your plate!! Christina - all your plans are exciting stuff!!! I almost forgot you are moving back to NC!!!! Ha Christina, the last thing you should be worrying about is commenting! So long as you keep stuffing boxes, and keeping me up to date with how you're doing, bitching to me occasionally...haha! I'm hoping to be able to watch King of Pastries sometime! It's funny that I JUST saved it to my Netflix! Haha!